This will be a very terse summary; however, the (link removed by moderator). My mother passed away March 1st, 2019. My sister coordinated services held March 16th, 2019 in Hobbs, NM. This project is a tribute to her. Mom left a car and loved traveling, even short distances. My sister and I would like it closer to us. Therefore, mom will get two more road trips, the one I’ll be taking her on as I travel back to Nashville, Tennessee and the one to scatter her ashes. My mother had a few dozen shells at her passing. During the memorial service we asked attendees to take a shell. By the ned of the service, there were 50 or so remaining. I converted those shells into hitchhikers on 50 trackables I own (see attached - only ~20 have what I started calling turtle shells because they're not all boxes). 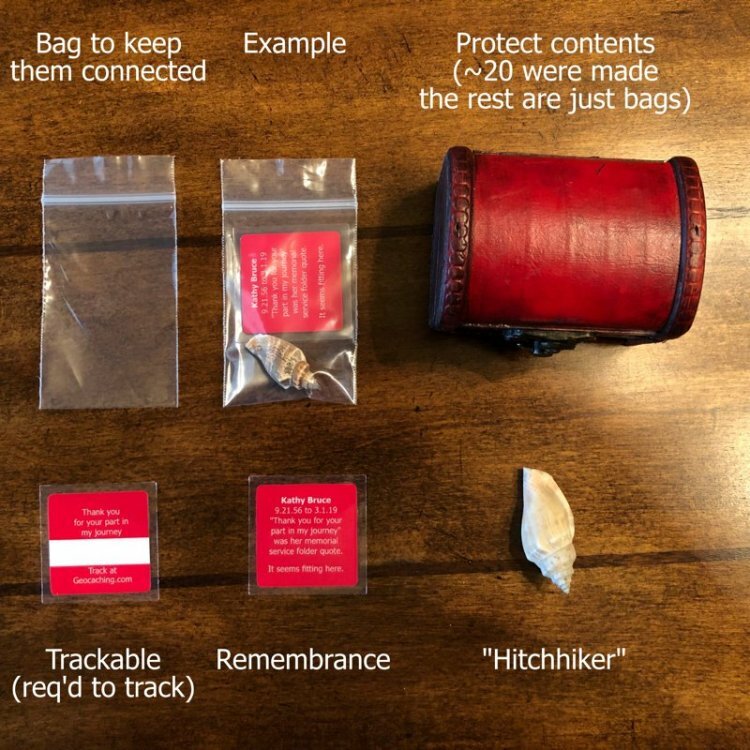 Each trackable has a goal, some more elaborate than others and, in a couple of years, we'll see how many can make it back to the Pike's Peak area in Colorado for the scattering. I have made it from Seminole, Texas to Austin. I was thinking I would start heading toward Dallas today to visit the Dr. Pepper Museum - then I remember it was Sunday and they're closed. So, gonna update the project and register the rest of the trackables instead. This thread will serve as a place for everyone (including me) to communicate around the project for now. Hashtags, if you're so inclined: #hido, #hidokd, and #hidoadventure - for better accessibility you can also title- or camel-case the words: #HiDo, #HiDoKD, and #HiDoAdventure - these aren't reserved to only this project, any adventure is good. ps. Thank you to the helpful folks in the forum who answered my questions and offered advice as this was being setup.